Forbes is the latest victim in a long line of high-profile attacks by the Syrian Electronic Army (SEA), sending a reminder to the international community that cyber warfare is alive and well. The pro-Assad group also took responsibility for hacking multiple Forbes websites and hijacked three Twitter accounts related to the website. 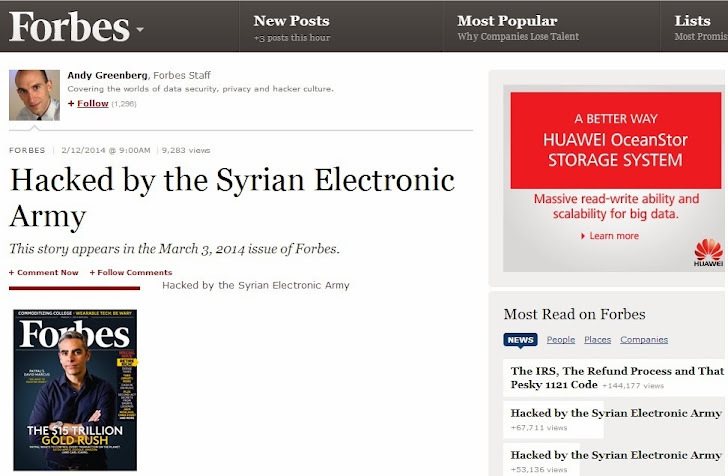 According to the screenshots published by the team, it appears the hackers gained the access to the Wordpress administration panel of Forbes website and edited several articles posted earlier on Forbes by authors Travis Bradberry, Matthew Herper, Andy Greenberg, John Dobosz, Steve Forbes and titled then as "Hacked by Syrian Electronic Army". Hackers tweeted, "Syrian Electronic Army was here" from the compromised Twitter accounts, including accounts of Social media editor Alex Knapp @TheAlexKnapp and Personal finance report Samantha Sharf @Samsharf, and @ForbesTech account. The Syrian Electronic Army attacked Forbes because, "Many articles against the SEA were posted on Forbes, also their hate for Syria is very clear and flagrant in their articles.". The Syrian Electronic Army group is notorious for hacking Western media. They have targeted media sites, including the New York Times, the Washington Post, the Financial Times, the AP, The Guardian, and Twitter over the past year.